Dinosaur Roar was not a picture book I has come across before and yet it was originally published back in 1994; the book is now available in a new paperback and board book versions endorsed by the Natural History Museum. With our recent visit to the Lost Kingdom, both girls are very much into dinosaurs at present and so they enjoyed reading this story with me. Holly is just starting to want to try and read herself so she had a go at some of the words - she certainly recognises the word "ROAR"! 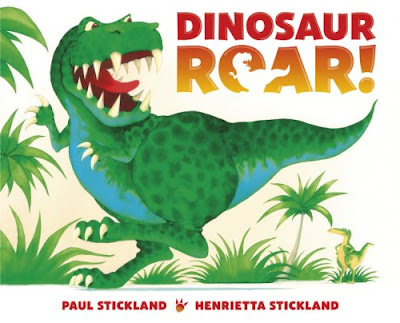 Dinosaur Roar is written by Henrietta Stickland and illustrated by Paul Stickland and is a fun rhyming picture book that features some interesting opposites. Not just your normal big/small thinfat type of opposites but also slightly more unusual opposites that made the girls ask questions such as fierce/meek or spiky/lumpy. Both of the girls giggled when we got to the end of the story and all of the dinosaurs were munching their lunches. The new edition of Dinosaur Roar! features brightly coloured illustrations and a special pull-out poster of all the featured dinosaurs that you can put on your wall and talk to as you read; it's a great opportunity to get the girls thinking about what they are listening to by asking them questions where they need to find the dinosaur answers on the poster. I thought Dinosaur Roar! was a great rhyming story book with a gentle but fun rhythm that has huge appeal.